RIW is pleased to announce that Catherine Barton Rossetti has joined the firm in the Trusts & Estates group. 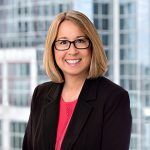 She works with clients of all asset levels in sophisticated estate planning, probate and trust administration, and advises clients on special needs planning for adults and children. Catherine counsels clients on minimizing estate tax liability to preserve and protect assets and avoid probate court.